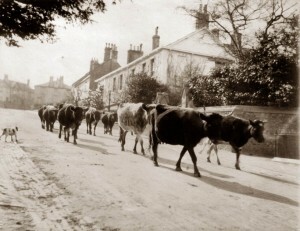 A herd of Cows in the Street outside The Court in Charmouth c.1900. The Village Echo is our journal; 43 issues have now been published since 1999 and contain a variety of articles of local interest from the recent and not so recent past. Issues 1 – 41 are now available to read online (see below). The Village Echo is free to members and costs £2 plus postage for non-members. Back issues are available at £2 per copy for recent issues, £1 for older issues plus postage, with discounts for larger orders. Please contact us to make an order or for more details. To search the complete set of available back issues (e.g. for names of houses or families) first use the search box on the top right of the home page, make a note of which issues the search returns, then go to the back issues page to view the pdf(s) and use the search in the top left of the pdf viewer to find occurrences of specific text within the pdf. To search for articles use the search of your browser to search the index of articles below. – Michael Priestley, Catherston’s Lost Masterpiece. – Robert Munday, Mr. Pavey’s Old Austin 16! – Peter M Press, I’m Off! – Gill Joye, Edwin Pryer – Who Was He?